The uniqueness of this situation has not been lost on U.S. military planners, and despite the arguments that continued reliance on commercial capacity might produce the most efficient and economically sound approach for the future, plans continue to move back to a more internally driven solution. So whats behind all of this use, and the future growth? And what are the DoDs options to address the emerging needs? First to DoDs own systems, whats in place now and whats coming on-line. As shown in the first chart, the DoDs MilSatCom systems are at a critical stage, with older fleets reaching end-of-life as new programs start to come into service. Over the next 5-10 years, the DSCS, first-generation GBS, Milstar and UFO systems will either cease operations entirely (DSCS and first-generation GBS) or be reduced to one or two spacecraft (Milstar and UFO). In their place the Wideband Global SATCOM (WGS, which includes new GBS capability), Advanced EHF (AEHF) and Mobile User Objective System (MUOS) constellations will be launched, each meeting different types of needs, and with much greater capacity than the predecessor systems. This capacity is important, as the chart also shows, to close the gap between MilSatCom capabilities and the baseline demand forecast from DoD. What Are the New MilSatCom Systems? WGS, built by Boeing, is the first of the next generation systems in orbit, providing Ka- and X-Band capacity, with each satellite having the capability of carrying 2.1-3.2 Gbps of data, some ten times the capability of the DSCS III spacecraft. The first WGS was launched in October 2007, with the second scheduled for launch in 2008 and these, together with the third, will create a global network of two-way interactive communications and broadcasting. The fourth and fifth satellites will incorporate enhanced radio frequency bypass capabilities designed to further support the ultra-high bandwidth and data rates demanded by unmanned aerial vehicles. A sixth satellite has also been ordered by DoD in conjunction with the Australian armed forces. The next new system to be deployed is the AEHF, being built by Lockheed Martin, and scheduled for launch starting in 2009 to replace the Milstar constellation. Operating in the EHF/SHF bands, enhanced by inter-satellite links, each of the four satellites will be capable of transmitting some 400 Mbps when fully loaded, with link rates of approximately 8 Mbps. A unique aspect of the AEHF system is that it is a multinational effort with partners from Canada, the U.K., and the Netherlands, each of which will access the AEHF network through their own terminals. While enhancing the value of the constellation, this international partnership means that the capacity of the AEHF system is not entirely available to the DoD. The third new constellation is MUOS, also being primed by Lockheed Martin to provide expanded tactical communications capabilities primarily to the U.S. Navy. Five satellites are currently planned, with launches starting in 2010. Each satellite will carry a legacy UFO payload along with an enhanced MUOS payload, ensuring backward compatibility. Each of these systems provides a discrete, specialized set of capabilities, with much more capacity than its predecessors, but all are intended to be part of the lead-up to a more integrated defense communications network which is planned through the development of the Transformational Satellite (TSAT) system, a key element for the future DoD global net-centric operations. TSAT, planned to provide some 30 Gbps of capacity, would overcome the gap to the demand line  a gap now filled by commercial systems. The TSAT space segment would allow for a range of capabilities including protected high-throughput communications-on-the-move (COTM), plus airborne Intelligence, Surveillance and Reconnaissance (ISR), and it would meet the strategic force requirements following from Milstar and AEHF. But TSAT has been delayed a number of times, and while now apparently moving forward again, requires extensive new technology developments both on the satellites and in the user terminals. This last issue  availability of the user terminals needed to take advantage of the expanded on orbit capability offered by new systems  is already a concern with the near-term programs described above, in particular MUOS. Somewhat ironically, while terminal developments and deployments appear to be lagging in satellite construction, it is the continuing evolution of technology deployments, including new sensors and receivers requiring massive amounts of bandwidth, that is the biggest driver of new demand for DoD satellite services. So what is the bottom line? 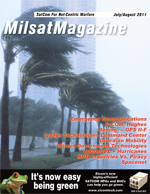 Until the major game-changing TSAT system becomes fully operational, all of the new MilSatCom systems now being launched will not be sufficient to meet the continually growing demand generated by DoD, meaning there is an ongoing, sustained DoD need for high levels of commercial satellite capacity. There is still debate on the level of effect the new MilSatCom systems will have on the overall DoD demand of commercial satellite capacity, especially including whether TSAT will dry up any significant amount of commercial capacity demand. DoD demand for satellite communications capacity is forecast to be at least 32GHz by 2016, while MilSatCom system capacity at that time is expected to be 17GHz in the C-, Ku-, Ka-, X- and UHF bands. This estimate assumes delays in TSAT to at least 2018. To fill the gap and meet the remaining requirements, DoD will need to acquire up to 15 GHz per year from commercial operators, primarily in the Ku- and Ka-Bands, although some X- and UHF-Band needs are also foreseen. In fact, demand in the later years is often presented in DoD forecasts as being as high as 47 Gbps by 2018, based on fielding of large numbers of terminals tied to TSAT capabilities. Key among these capabilities would be the ability to interconnect mobile terminals around the globe, building on what has already proven to be a major driver of DoD satellite capacity demand: the need for mobility and flexibility to provide COTM and ISR including the acquisition/delivery of data from UAVs. If the capabilities of TSAT meet its planners expectations, and the technology emerges to enable broad-based device-to-device communications, TSAT will, itself, drive the demand curve back up from the baseline shown above. There is clearly a strong and growing demand for satellite capacity to meet ever-evolving DoD requirements. While TSAT may provide a solution to meeting these requirements, there is a clear opportunity for both commercial satellite operators and ground equipment providers to address this challenge. Taking the latter first, as noted above, the availability of user terminals is a pacing factor in the use of new satellite capacity. Industry and DoD working together need to address both the standards and technology issues key to moving forward with production and fielding of those terminals. As to the space segment, for at least the next decade DoD will continue to need to acquire on-orbit capacity from commercial providers. Given the length as well as depth of this need, it only makes sense for DoD and the commercial satellite operators to develop a new approach to their partnership. While DoD needs 5-10 years to get new satellites on-orbit, reflecting the advanced technology developments planned for such satellites, commercial operators have the ability to design and deploy new capacity, even with specialized payloads, in 3-5 years. Without some commitment from DoD to their use of such payloads, however, it is hard (if not impossible) for the operators to convince their management/investors to fund such developments. In some countries, notably the U.K., public/private partnership is a key element of military satellite communications. And in other areas of satellite service  specifically remote sensing  shared investment commitments are proving key to the deployment of new technologies and capabilities that benefit both government and commercial entities. There is every reason to believe that similar partnerships could provide the opportunity to support and enhance growth in DoDs communications technologies and services.